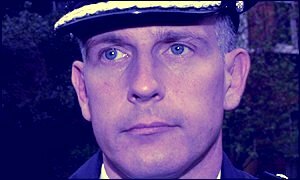 The Metropolitan Police Authority disciplinary panel for ACPO rank officers today announced that there would be no further disciplinary action in respect of the allegations against Brian Paddick and that the matter was “closed”. The Metropolitan Police Authority disciplinary panel has decided to ask Brian Paddick for yet more information regarding the allegations against him, this time taking 4 weeks. This after a six month investigation and a three week review by the CPS (more). 1 Oct 2002: Paddick’s contribution acknowledged. The meeting warmly endorsed and welcomed A/B/C Moore’s gracious acknowledgement. 1 Oct 2002: Local MP speaks up. Local MP Keith Hill (Labour, Streatham) has written to Commissioner Sir John Stevens, expressing his surprise and concern about rumours that the senior post in Lambeth is to be doowngraded (see below). In his letter he said "The new post was created only 18 months ago. The justification offered at the time was that the lead-ership of the police in Lambeth was a high-profile role because the division experiences particularly high levels of crime and significant community tensions." He added: "You will recall the announcement was warmly welcomed in Lambeth as evidence of the Met's powerful commitment to the fight against crime in our locality." He wants to know what has changed in the past year-and-a-half, and who was consulted about the decision. Mr Hill has also asked if the decision will stop the return of Commander Brian Paddick to the borough. At last, a local politician speaking up for the people of Lambeth on policing issues. There have been a number of reports that the Met is considering downgrading the chief officer’s post in Lambeth from Commander to Chief Superintendent, effectively precluding Brian Paddick’s return (only Lambeth and Westminster have this rank for the post). Justifiably, there has been a robust response from Lambeth. Lee Jasper said "If such a move was being done, without consulting the community, to get rid of Brian Paddick, there would be uproar”. The decision to grade Lambeth at Commander level was made as recently as January 2001, on the basis of the size of the command (bigger than many provincial forces) and the particular policing problems in the borough. So what has changed? 17 Sep 2002: Who orchestrated the media frenzy over CPS? According to the Guardian, the report by Humberside’s Deputy Chief Constable, Gordon Clarke, into allegations against Brian Paddick,was sent to the Crown Prosecution Service (CPS) on Friday 13 September. The CPS are required to consider if there are any criminal charges arising from the investigation and the referral, though not inevitable, was always likely given the public interest in the case. Nonetheless, a panel of the Metropolitan Police Authority (MPA) met to consider any disciplinary implications of the report, on Monday 16 September. Inevitably, they had to adjourn their meeting to await response from the CPS since, as the MPA press release pointed out,”it is normal practice for any criminal proceedings to take precedence over disciplinary matters”. Over the intervening weekend, however, media expectation of the MPA meeting was carefully ramped. Several papers labeled it “D Day for Paddick”. The reports were well nigh identical - the MPA meeting was described as being one of the Association of Chief Police Officers; they all carried dated comments from Toby Harris, Chair of the CPA. In fact, informed commentators continue to report that it is highly unlikely that the CPS will find anything worth taking further in the report: “It is understood, however, that the four-month investigation has uncovered little or no incriminating evidence against the 43-year-old officer” (Independent). On what authority did the investigating officer refer the report to the CPS - his own or the MPA (the London Tonight programme suggested an “administrative error”)? If the MPA knew the report had been referred on Friday, why did they meet on Monday, knowing they could not make any decisions? Critically, who was busy winding up the media over the weekend, guaranteeing “Paddick faces possible charges” headlines on Mondays bulletins? According to the Daily Mirror’s “Scurra” column, Brian Paddick has received an Award of Merit from the Daily Mail, commending him as an “unsung hero”, in response to the wide support shown for him in the paper’s Jubilee Campaign. The accompanying letter praises his “unstinting work” and encourages him to keep “up the good work”. We say: There is more rejoicing in heaven..........? Back in March, a spokesman for Commissioner Sir John Stevens pledged “If these charges are not proved, Commander Paddick will return to his duties” (Observer, March 24 2002). We’ve no doubt the Commissioner, a knight of the realm, will be true to his word. At their Annual General Meeting tonight, Lambeth Community Police Consultative Group (who called the March Town Hall meeting in support of Brian Paddick), reaffirmed their support. Speaking for the Group, chair Lee Jasper said “Brian Paddick is a refreshing and honest police officer who engaged well with the his community. He was a good commander who always spoke to the CPCG in an open and honest way and who made sure Brixton police station was always open to members of the Police Complaints Authority. He contributed in no uncertain terms to maintaining a balance within our community." The Met today released a media response to the Home Secretary’s statement. It welcomes the reclassification of cannabis and announces the effective roll out of the Lambeth trial, with modifications, across London in the autumn. The trial in Lambeth with formally terminate at the end of July and the new approach will be implemented with immediate effect. The Met statement also detailed, for the first time, the full impact of the trial in terms drug related arrests. Both the effective roll out of the trial, and the statistical report of its outcomes to date, vindicate Brian Paddick’s judgement, made over a year ago, in running the trial. Speaking in the House of Commons this afternoon, David Blunkett (Home Secretary) announced his intention to reclassify cannabis from a Class B drug to a Class C drug, under the Misuse of Drugs Act (1971). The maximum sentence for dealing in cannabis will be increased from the 5 years determined for Class C drugs, to 10 years. It is reassuring that the Home Secretary has withstood the intense grandstanding around the Lambeth trial, and followed the spirit of the Runciman Report and the Home Affairs Committee Report. Now the decision has been made, it is important that an independent evaluation of the Lambeth trial is set in progress, for the benefit of Lambeth and the nation. Adverseries in the controversy should set aside their differences and work constructively, with the police, to ensure this change in policy is effectively and safely introduced. The decision effectively rolls out the Lambeth trial to the rest of the country. That is a powerful endorsement of Brian Paddick’s farsighted initiative. It provides further justification for his return to Lambeth. Opposition leader Iain Duncan Smith visited Brixton today with shadow Home Secretary Oliver Letwin. He met with members of the community in a closed meeting in a local church. Accounts of the meeting vary. The Times reported that Mr Duncan Smith was met with support for the Lambeth trial, whilst the Independent reported that some of those attending wanted to see the evaluation of the trial before taking a view. Meanwhile, the Daily Mail front page carried a photograph purporting to show drug dealing going on outside the church whilst the front bench duo were inside. Local residents, who say that open dealing is unknown in the quiet, residential area, are aghast. Moves are afoot to petition the Press Complaints Commission demanding that the Mail either produce the “drug dealers” or apologise to local residents. 13 June 2002: Paddick up for Daily Mail Award. Earlier in the year, the Daily Mail announced their Unsung Jubliee Heroes campaign, inviting nominations of indiviuduals who bring real benefit to their communities, perhaps through public or voluntary service. Community Police Officers were given as one possible example. 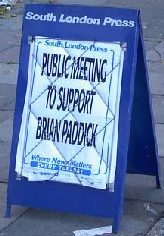 Many in Lambeth were moved to nominate Brian Paddick, citing his clarity of vision and commitment to the local community. They were delighted to receive a letter from the Daily Mail, thanking them for their nominations, which said “It is indeed a truly uplifting story [of Brian Paddick]” and “We have been deeply moved by stories, like yours, of individuals who bring so much to their local communities and are so deserving of an honour”. Only hardened cynics queried the sincerity of so beautifully crafted a letter and some even went so far as to suggest that it might have been written by a computer! An early visitor to the lambeth4paddick stall was Lambeth Town Crier, Alfie Howard. On July 31, 90 year old Alfie was rushed to hospital having been hit in the head by an 18 inch crossbow bolt,in Brixton Road. He received stitches to his injury and was allowed home. Police believe the bolt was not aimed at Alfie but was irresponsibly fired in the air. They are offering a £5,000 for information leading to the arrest of the person responsible - contact Crimestoppers on 0800 555111. We join Alfie’s many friends in Lambeth in wishing him a speedy recovery and hope he will not be discouraged in making his unique and colourful contribution to Lambeth life.